A heated industry debate was sparked last week by the announcement that Paramount and Warner Bros. would release director Christopher Nolan’s next movie, “Interstellar”, on film. Many of you may recall film as the sprocketed acetate material used by the motion picture industry to shoot, distribute and exhibit movies for more than a century before Hollywood studios “forced” cinema owners to install digital projectors. Adding insult to what some theatre operators see as injury, “Interstellar” will open two days early in theatres showing it on 35mm, the rarefied 70mm and IMAX. I can understand the frustration certain exhibitors must feel at such news. Having shelled out millions to upgrade their facilities, they wind up watching those using analog technology get rewarded with exclusive access to a highly anticipated title (even if only for two days). Maybe because of my age and generational ties, or maybe because I was trained at an educational institution commonly referred to as a “film school”, I am rather excited “Interstellar” will be shown on good old fashioned celluloid. I believe, with certain caveats, the decision can help boost the movie’s box office across all sites in which it is booked, no matter the method of projection. I used to own a phonograph. I don’t anymore, though kind of wish I did. My last turntable was part of a component stereo system which I purchased upon graduating high school. It was 1989, a time when record stores still stocked vinyl alongside shiny compact discs. Heck, it was even a time when record stores still existed. Ultimately, those reflective CDs took over more retail space and pushed vinyl records into a small corner of most stores. Some merchants just stopped carrying vinyl altogether. I lugged that turntable around for the next 16 years from dorm room to dorm room and between every shack, apartment, and home I ever leased or owned. Even though I stopped unpacking my crate of vinyl records after moving into a new home, I’d still make certain to set up the phonograph… just in case someone stopped by with a first pressing of Led Zeppelin’s last album. At some point shortly after Napster had decimated the music industry through digital file sharing, I realized the absurdity of continuing to make room for the record player in my stereo cabinet. It was relegated to the garage… stored next to the crate of records it was meant to be playing. The phonograph sat there gathering dust for a few years as any sentimental or psychological attachment I had to it withered. I finally gave it away to some friend of a friend. I can’t even remember who exactly. Of course, I would never give up my crate of records. There are some real gems in there dating all the way back to my days in primary school, including an autographed copy of “Bob McGrath Sings For All The Boys and Girls“. At this point you might be wondering what my record player has to do with “Interstellar” being released on film. Technically, it doesn’t. Emotionally however, there are direct ties. To me, a phonograph and vinyl records evoke a certain nostalgia of a “simpler” time when musicians performed on real instruments, when recorded music sounded better than the compressed bytes we now listen to and when music was considered more important than it is today. Of course, the reality is that musicians were often playing instruments that required electricity, the audio quality of compact discs was far more consistent over time and music is just as important today as it was when vinyl records were en vogue. Still, the vinyl medium and technology are tied in my mind to memories that are generally positive. Though the motion picture industry may have fully adopted digital technology some time ago on a practical level, movies as an art form are only now going through the slow transition of adapting to a new aesthetic. Similarly, moviegoers of a certain age are doing the same. Many under the age of 25 have what one of my colleagues recently referred to as “digital eyes”; they grew up watching so much computer generated digital imagery in movies and video games that when seeing the grain, texture and shaky registration of a projected film they find it less appealing, or at the very least, antiquated. Alternatively, those of us on the north side of 30 often find digital cinematography to be too pristine and lacking the visual spectrum offered by analog film stock. Nolan falls into this latter camp and has been quite vocal in his preference for film over digital. Believing it is currently the superior medium for both capture and projection, he has taken to shooting portions of each movie in IMAX. It should come as no surprise that Nolan wants his latest film to be distributed, at least in part, on film. In fact, Nolan recently demonstrated he is well aware (not to mention quite skilled at) how the celluloid format can be used to connote bygone eras and manipulate audience emotions. Last December’s teaser trailer for “Interstellar” weaves film footage of historic events such as the Dust Bowl of the 1930’s, Chuck Yeager breaking the sound barrier and the first moon landing, with images from the actual movie which remind us of all the special moments in which mankind overcame tremendous odds. In this manner, Nolan is tying the film medium to our positive memories of these historic images. Put another way, Tarantino is saying that audiences will head to cinemas if there is a special reason to do so; make the exhibition of a particular movie was itself an event. Actually, you might recall before alternative content was rebranded as event cinema, the phrase “event movie” referred to a film in which its release was played up as… well, an event, driving moviegoers to the theatre. Somewhere along the way the word “tentpole” has replaced the word “event”. Paramount and Warner Bros. are buying into this thinking by making audiences anxious to see “Interstellar” during its first week in release at a theatre showing it on film. As such, the studios have turned the release of the movie into a special event, even more than would already be expected for the opening of any new Nolan film. Some theatre operators however are justifiably upset they haven’t been invited to participate in the special event. More accurately, these cinema owners can’t participate because over the last 10 years they headed the urgings of the industry-at-large and jettisoned their analogue film equipment in favor of state-of-the-art digital technology. There were the inevitable stories in trade publications about cinema chains being upset about the early release of “Interstellar” on film, usually with quotes from smaller circuits. Many of these exhibitors can’t afford to keep both analogue and digital projectors running in the same venue and even those that can do not always have the booth space to do so. (The iconic TCL Chinese Theatre IMAX is having a 15perf 70mm projector installed in order to show the movie on film). This is why only 240 theatres in 77 markets will actually get to play “Interstellar” early on film. Of those, 41 will be IMAX presentations and 9 will be showing a 70mm print. An in-depth explanation of each format in which the movie can be seen is a big part of the “Interstellar Space Hub“, a unique (and educational) website that Paramount and Google partnered on for marketing purposes. If one wanted to be sarcastic (and really, who doesn’t), they could suggest including information on the website detailing how to thread a film projector since most theatres no longer employ projectionists. The upside for exhibitors, even ones that won’t be screening “Interstellar” on film, is that Paramount and Warner Bros. have generated an avalanche of coverage through their analogue initiative. If building massive audience awareness is one of the ingredients to assure a new release has the best shot at box office at box office success, then it’s safe to say when it comes to “Interstellar”, mission accomplished. 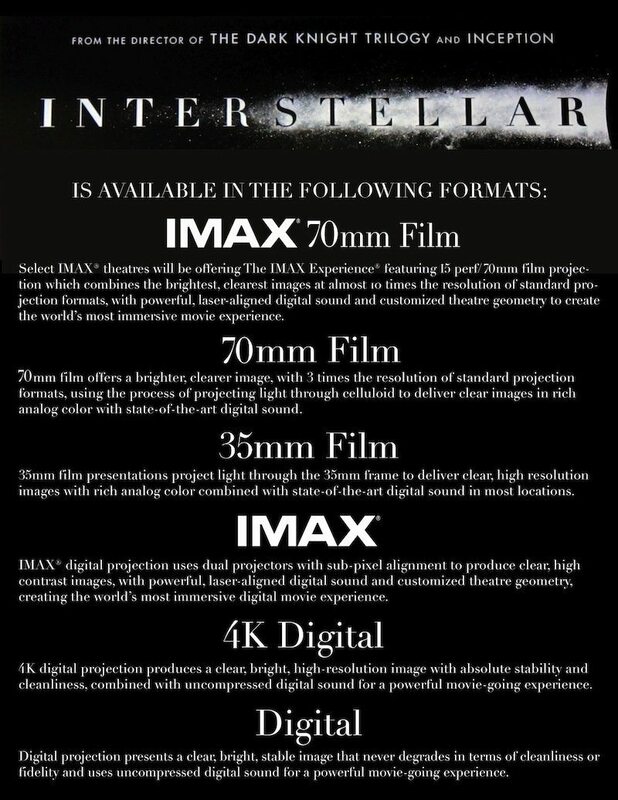 Tags: Warner Bros, IMAX, Paramount Pictures, 35mm, Quentin Tarantino, Christopher Nolan, 70mm, "Interstellar"